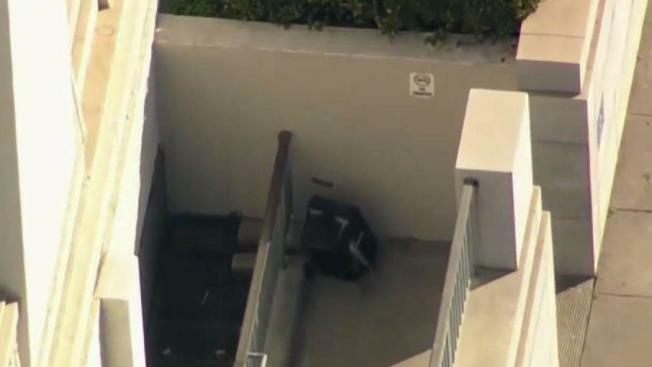 Oakland police officers and a bomb squad from the Alameda County Sheriff's Office on Wednesday investigated a suspicious backpack that was reported at the Alameda County Superior Courthouse, and took a man into custody in connection with the package. People in the area were asked to shelter in place around 12:10 p.m. and 12th Street was closed to traffic, according to the sheriff's office. The scene was declared safe at 12:30 p.m. and the bomb squad given the all-clear. Sheriff's deputies said courthouse operations, which were interrupted for about 90 minutes due to an evacuation, have resumed and roads in the area have reopened. One man, who officials believe is connected to the backpack, was detained on Fallon Street. "He assaulted deputies," according to the Alameda County Sheriff's Office's Twitter page. Sgt. Ray Kelly said that the sheriff's office was already on high alert since the courthouse has been hit by "advanced Molotov cocktails" twice in recent days. The first attack occurred about 10 days ago and the second at 4 a.m. Wednesday. No one was hurt and no property was damaged, he said.